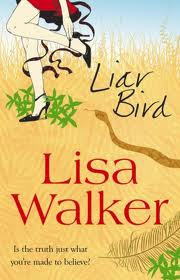 I am currently reading Liar Bird by Lisa Walker. I am not 100% sure how I would characterise it in terms of genre, but I am leaning towards the catch-all women's fiction or even chick lit. Whatever you want to call it, there is no way you could mistake the setting for anything other than Aussie. My Bookish Quote/Teaser Tuesday comes from the page 5 so right at the beginning of the book when we are just getting to know the main character, Cassandra. Her perfect life is just about to fall apart in a big way. I knew I had about ten minutes, maybe twenty - plenty of time. My feet sank into the hand-woven Turkish carpet as I padded to the meditation room. Pulling out my tattered copy of The Annotated Alice, I opened it randomly, closed my eyes and pressed my find to the page. "You don't know much," said the Duchess, "and that's a fact." I nodded - so true. Spot on, in fact. What follows after this quote is a whole passage about how Cassie found the book and how much she treasured it, but it was too long to type it all out! I can't imagine using a book like Alice in Wonderland as guidance for life, can you? Before I finish this post, I thought I would share a video about the native Australian Lyrebird that this book obviously has taken inspiration from in terms of the title at least. This bird has the amazing ability to be able to mimic all sort of noises - other bird species, construction tools, cars, humans and more! This video was all about Chook who was the male lyrebird at the Adelaide Zoo. He died recently at the grand old age of 32. In addition to the mimicry, they can put on a very impressive display with their tails to help protect their territory. An all round amazing Australian native animal. There has been an appearance of one lyrebird in the book so far, along with some other rare wildlife! I have seen this a lot on my ereader sites and wondered about it, thank you for posting this Marg! However, I am still undecided! I would love to hear how you got on with the finished book. Would love to hear what you thought of this book, i've seen some recent positive reviews and would like an excuse to read something from an Aussie author i am unfamiliar with. Pat and Jayne, I really liked it. Review should be up on Thursday. Amazing creatures, these unusual birds. Wha a copycat bird, Fascinating. Was Liar Bird inspire by the lyrebird? I don't know about being inspired by the lyrebird,but it is definitely an appropriate title. Using Alice in Wonderland as a guide for your life probably has some pretty interesting results! I would be interested in reading this book and finding out what happens! It's certainly an interesting choice to use as a guide to your life!